Just figured I'd make a post to let all the members know that I decided to prove the statistic true that new riders are most likely going to lay their bike down which in the first 3 or 6 months of riding. I also want everyone to know that riding when theres ice on the road don't mix. Also for any new members reading this, do yourself a favor & get a light bike, not only for the obvious safety reasons I won't mention but also for the embarrassment factor. IT WILL BE EMBARRASSING & MORE THAN YOU PROBABLY THINK (ESPECIALLY IF ANYONE SEE YOU)......WHEN YOU LAY IT DOWN. I just laid mine down for the first time this morning, after the rear wheel happened to catch some ice as I was turning on to my street from a side street 2 doors down from me (heading back home).....that I didn't see but the rear tire had no problem finding for me. It spun me completely around than laid down on its side, before I had a chance to react in anyway. 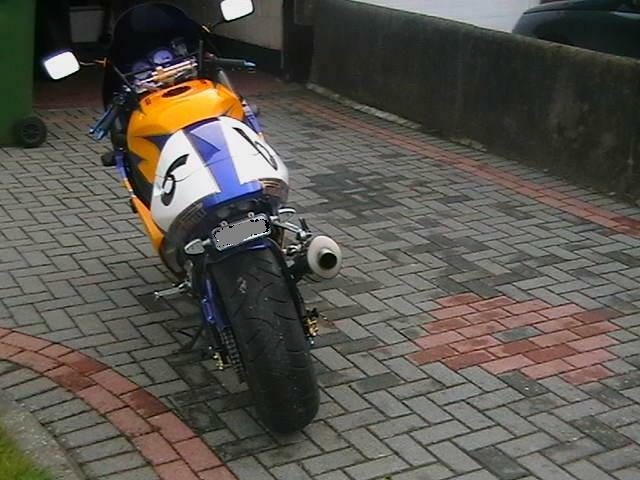 The bike was not damaged, other than a few minor road scrapes on the right side exhaust pipe, end up the throttle grip & end of the front brake lever. I was not injured, other than a very small scrape on my right leg from the bike landing on top of me. However, the embarrassment of it (two people driving down the road seen me lay it down, both seen me as one slowed down & moved over to avoid me & the other actually stopped to ask if I needed any help). Believe me, the lighter the better, as bikes being on top of you aren't comfortable & you will be embarrassed quite bad but can ease that embarrassment if your able to pick it up on your own. I found this out first hand today & I'm sure every experienced rider will agree. Sorry to hear about you going down. I remember the first time I went down. Unfortunatley I had my girlfriend on the back at the time and she ended up getting a sprained ankle. I was lucky enough to slow down and lay it down in some soft sand on the side of the road. I found that when picking up my bike it is easier when you pick it up from the wheel side and lean back. sorry to hear about you going down Tim. I myself learned a hard lesson years ago with my first crash. Mine was bikes and alcohol, they definately don't mix. Don't give up, take your lesson and move on, motocycling can be a lot of fun, and anything in life that is fun, or feels good, is dangerous. Be careful and keep riding! Glad you're OK. I am constantly thinking about the day that I may go down. Helps to keep my attention and focus. Falling off the bike happens to the best of us its all part of learning. Glad you did'nt hurt yourself. It makes you more aware of the hazards around you. There is nothing you can do when going over ice just stay away from the brakes. Lighter bikes are easier to lift off you but they take more damage when hitting the ground. Heavier bikes stand a belting when hitting the ground. Glad you are allright, keep biking. I have been riding for about 4 months now and I am grateful that u have posted about ur bike going down. I am always trying to keep an eye out when I am riding for potential dangers but even if you are always staying aware, seeing or hearing about someone lay one down is still a wake up call. By the way, what kind of bike do u ride? I have quite a few bikes as i collect them. I dont have any choppers as i never got around to them and i find them a little heavy. Mainly i have sports bikes but i do have retros aswell. It depends on my mood on what bike i drive from one day to the next. 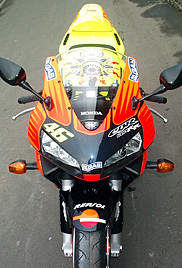 I have left a pic of one of my bikes in introduce youself under my name should you want to view it. 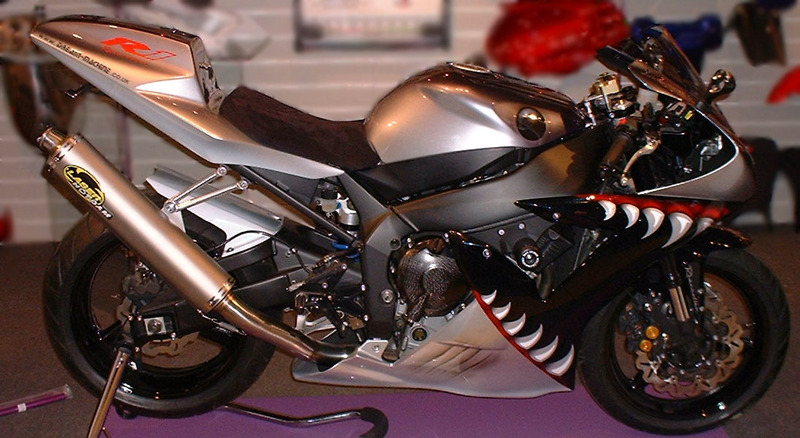 Borg, thats an awesome looking bike. You should post some of the pics you sent me. I think the forum surfers would love to see more of it. (its painted, not a sticker job, BEAUTIFUL) Can you hear them chanting? ...... "WE Want More, We Want More, We Want More"
More pics of the gsxr? 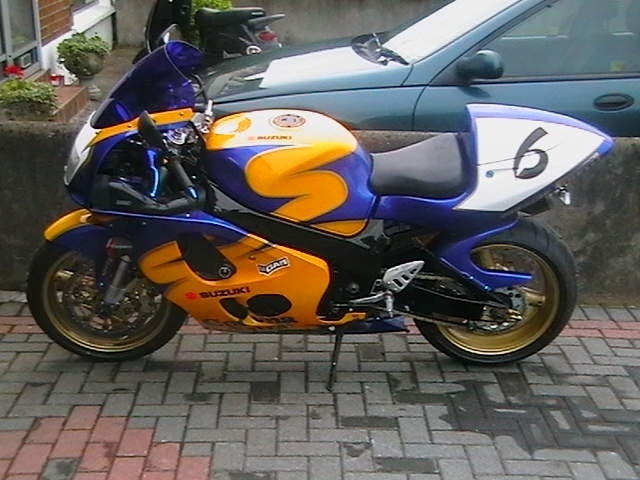 I can put the R1 thats painted like a shark if you like. I'll get the gsxr pics ready. I will change the pic of my username every day to show all the bikes i have. So all of you can review the pics and leave any questions about any of them. I have a gsxr 1300 with a spray job that took 7 months to do. Its a one off and it will be the last pic for viewing. 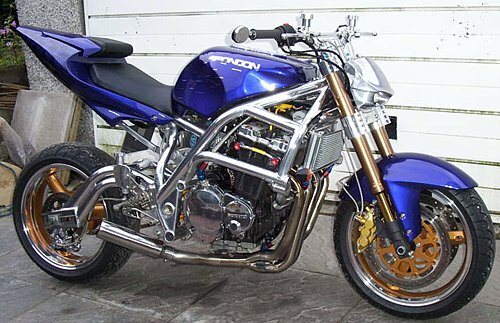 Its the best spary job you will ever see and not to metion the bike has custom parts aswell. It has been in bike shows on display. 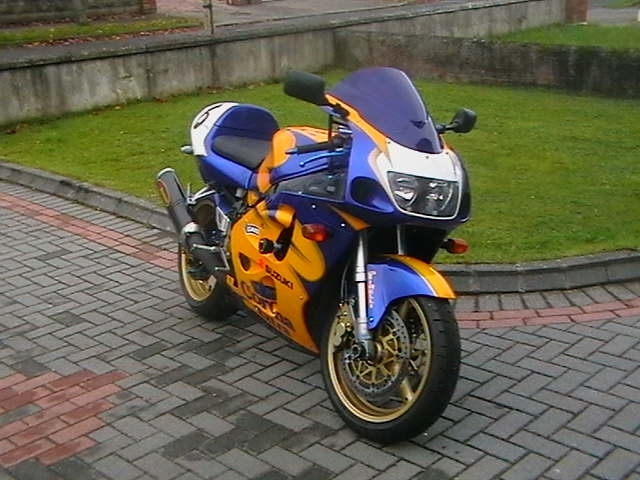 I will finish off the gsxr 750 srad pics first and move on to the rest of them. 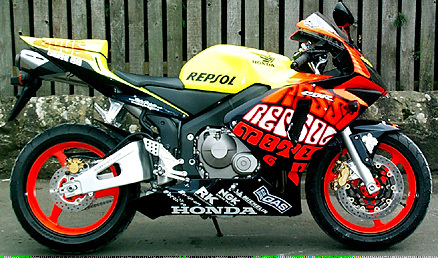 The next after the gsxr will be the R1 sprayed like a shark. I said i was going to do this from the start and thanks to behondthepaint for reminding me. it is better than changing your pic every day. Glad you are ok. I too had a bike go out from under me on ice. I also was on my way home and just two houses away. I was lucky and no one saw me. Thanks ill have a look. I will check that out, it sounds alot better than changing my username pic every day as i have alot of pics to show. Thanks for this. Check out a few pics ive left. 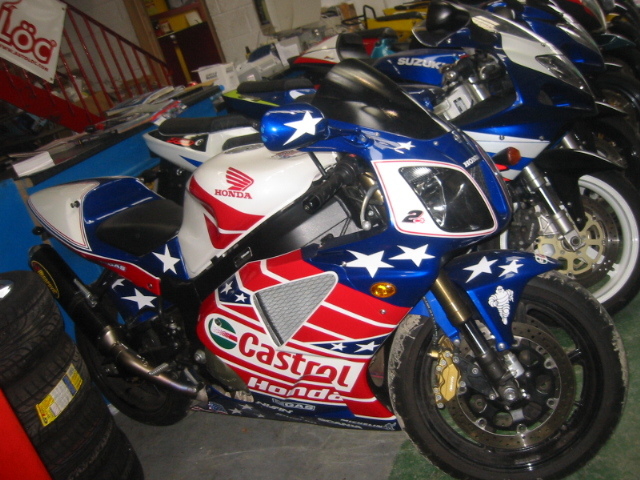 Here are the pics of the corona gsxr that behondthepaint was talking about. Your views and comments are wellcome. 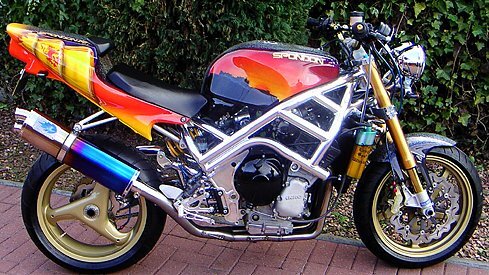 Does anyone like street fighter bike. Have a look at these two and tell me are they over the top or just right or do they need anything else. Borg, where are you from? You really have some sweet looking bikes, I would love to see some in person. My home is in texas. so you can see the collection in person. All the bikes are checked daily to make sure they are running right. So you can drive whatever bike you like when you are there. I dont brag or boast about my collection as theres no need in that, i simply collect bikes like people collect stamps. Borg, I would love to see the collection, and maybe even paint one for you. My neighbor has a bunch of vintage bikes, but none restored. I still like drooling over them. What kind of work do you do that keeps you traveling so much? I travel a lot with my son, going to races and gymnastics competitions. Someday I hope to take him to Europe. I was an army brat, and grew up in Germany. Gotta love the autobahn! Check out his site, he dreams of racing professionally, and maybe making it to the olympics. http://www.jkyleperry.com let me know what you think. Have a look at this lot. Those are beautiful bikes. I take it they are all paint like the Corona bike. Just beautiful, you have good taste. I have a few oldies but i hav'nt touched them at all. Might be best not to. It might take the old look from them. I hav'nt gave them much thought to be honest. I'll look into them. Checked your son's web site its very well done and i left a message for him. My work, well i have holdings in different parts of the world and have to visit them once and a while. On the subject of painting a bike for me i agree, you should do that. 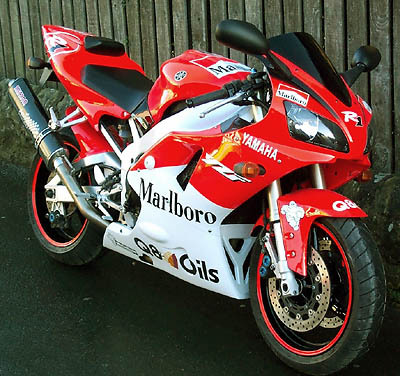 The next bike i come across ill get it shipped to you and you can pick the scheme. I will give you plenty of notice and the shipping date. I have your shops address and phone number. I dont like bikes to be rushed i like time put into them and i know you have the same judgement. Time limits dont exist with me the longer it takes the better it will be. Chat tomorrow have to go now. I agree with the rushing part, you can't rush paint. I laugh at some of these bike shows where everything is rushed. Makes me wonder how its going to look in a year. But there is taking too long. On big projects, I like to tell the customer, "you'll always see progress". I went down as well, 04 GSXR600. Went down my second season with it. Was my second bike. Wet grass + Back Motorcycle Tire + Dry Pavement = Disaster at low speeds. Like you I fell 2 feet from my house. I was actually headed to school. Im 5.5 weighing 120 and with the addrenalin i picked up my 350lbs bike with ease! 2k in damages. couple battle scratches nothing to big.. Almost cried for the bike wasnt worried about me =) Usually how it always is.. "is the bike ok?" haha. Anywho looking to get a brand new one sometime this month =)!